When traveling to Arizona to play golf, there are the “must play courses” and then there are the must plays. But with over 300 courses throughout the state, how’s a club-packing golfer to decide where to tee it up? The answer is easy, visit www.TroonGolfAZ.com first. Here you can gather course information, book tee times, checkout stay and play packages and more. All of these Troon-managed properties are set in stunning locations and capture the essence of the American Southwest. From the magnificence of the Boulders in Carefree and Troon North in Scottsdale, to the Sonoran Desert beauty of Whirlwind Golf Club in Chandler, each course has its own unique way of leaving you speechless and amazed. 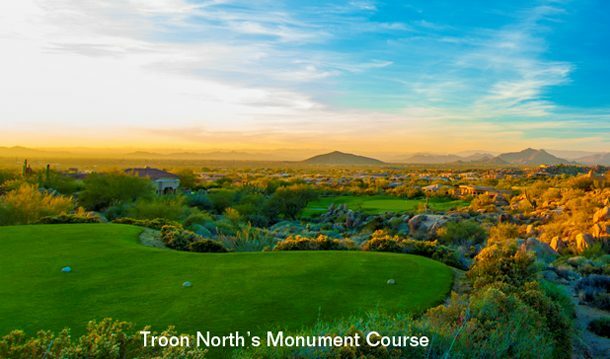 In addition to delivering on beauty, incredible service and outstanding playing surfaces, Troon’s Arizona properties are focused on making the game of golf more fun. For example, The Westin Kierland Golf Club offers guests the option of playing on Golf Boards, Golf Bikes or Segways. For golf traditionalists, Kierland, the Boulders and Troon North also offer the option of playing with a caddie. If you’re spending more than just a few days playing golf in the Arizona sun, think about purchasing an Arizona Troon Card for additional savings. Troon Cards, available as TwoSome or FourSome Cards, are the absolute best way to play Troon’s top courses at the lowest rates.